A Smörgåsbord of Alternative Energy Treats à la Carte Sure to Set Off Some Fireworks! Independence Day is here, and it’s time to fire up the grill with a few tasty bites from the overflowing pantry of alternative energy. 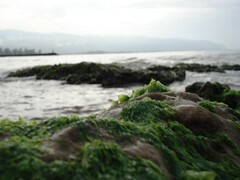 For an appetizer, dig into some ocean algae that may one day soon be a superior producer of biofuels, at least according to researchers from Kansas State University. Well, don’t actually eat them, because they are probably not too tasty, and that’s good news, because using algae to make fuel could leave more corn (that would otherwise be used for biofuels) on the market for much-needed food supplies. Another way to use tiny living things to make energy for us is to let microbes turn hard-to-reach oil into easier-to-extract natural gas. That is the goal of a group of Canadian and British scientists. If their research goes well, injecting microorganisms into wells formerly deemed depleted could renew production. And when will this exciting development get those gasoline prices below $4 a gallon again? Well, let’s see, the original biological process took tens of millions of years, so…. 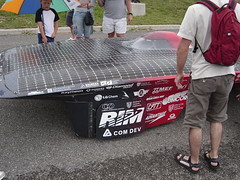 What better way to have fun in the sun on Independence Day than with a solar powered car. A group of students from Iowa State University are planning to compete in 2,400-mile race from Texas to Canada in a $400,000 sun-powered vehicle that looks like a souped-up ping-pong table-but hey, that’s a zero emissions ping-pong table that can cruise at over 30 miles per hour. More (solar) power to them! You may one day declare your independence from less efficient chemical batteries to power your stuff as fuel cells become more efficient. Researchers in Germany are working with carbon nanotubes to make components for fuels cells that are ten times lighter and weight far less than conventional amorphous carbon structures used now. Even more impressive, these tiny-only several atoms thick-tubes boast 1000 times the electrical conductivity of their conventional counterparts. For something a little more practical for you, the average American celebrating the quintessential summer holiday, you can get your very own fuel-cell-powered car and its solar-powered hydrogen production plant (which makes fresh fuel for the fuel cell)-and the whole package is only $99.99! Well, the model car is only about six inches long, but the science is real-and very cool. You’re sure to be the hit of the picnic. As the warm July breezes whisk away your paper plates and blow that BBQ smoke right back in your face, rather than complain about the weather, celebrate the fact that Texas has the fastest-growing wind power industry in the USA. An ultra-clean, and only somewhat noisy, wind turbine-or a whole farm of them-may soon be coming to a desolate hilltop near you. The question is, “What’s the next big thing in Texas energy?” and the answer, my friend, is blowing in the wind. Big time oilman T. Boone Pickens is betting $10 billion on that. Another hot topic (aren’t they all?) for this hot month is geothermal energy-producing steam with the natural heat from the earth’s interior. I just got back from Iceland, where that clean and renewable source provides 90% of home heating energy-and allows for really long hot showers. Here in the US, we could supply the electrical needs for over 260 million Americans if we tapped in to only 5% of the geothermal potential available in our own underground. There are plenty of challenges to make this work, but you can bet that as hydrocarbon prices soar, those obstacles won’t seem quite so big. As that sweet smelling smoke from the wieners and burgers on the grill wafts into the upper atmosphere, don’t overlook the contribution that it adds to your carbon footprint, and how that footprint contributes to global warming and climate change. Scientists are realizing just how hard it is for individuals to influence those numbers significantly-even the austere lifestyle of a Buddhist monk produces about 1/3 the carbon emissions of a typical energy-hungry American. So do we just give up? Of course not-we need to think more about alternatives already mentioned here-and walk more. The person who comes up with the carbon-free barbecue that still delivers that smoky flavor might be up for a Nobel Prize, at least in my book. When you finally get back to the crib, your belly full of beef (or veggie burgers) and your eyes glazed from too many red, white and blue exploding chrysanthemums and Catherine wheels, you can settle back into your chair and read up on more energy topics the old-fashioned way-by the cozy glow of a zero-emissions gravity-powered lamp. Now, that’s a down-to-earth solution!